The establishment of a Russian military base in the Arctic is the country’s reaction to growing threats to its national security and is also aimed at the protection of its economic interests in the region, writes military specialist Viktor Litovkin. In the early days of September, construction began on a unique military base on Wrangel Island, which is situated in the Chukchi Sea at the junction of the eastern and western hemispheres, and on Schmidt Cape, on the nearby Russian mainland. Officers and contractors will be able to live and work at the base, which has been given the name Polar Star, monitoring all air and naval situations and the situation in the Northern Sea Route. A similar camp is being built a little to the west of this location on Kotelny Island, which belongs to the Novosibirskiye Ostrova (New Siberian Islands) archipelago. The caravan of ships bringing construction materials to the sites includes the large destroyer Admiral Levchenko, the large landing ships Georgy Pobedenosets (St. George) and Kondopog, the tanker Sergei Osipov, the rescue tug Pamir, and the Baltic Fleet’s AHTS (anchor handling tug supply) vessel Alexander Pushkin. The group will be accompanied on those segments of the route that are covered in the widest ice fields by the nuclear icebreakers which are constantly on duty in the region. They belong to the corporation Rosatom. “The chief objective of the latest journey by the detachment of ships from the Northern Fleet to the Arctic is to deliver the personnel, equipment, and property of the fleet’s tactical group, which will be serving on the New Siberian Islands on a permanent basis starting this year,” announced the commander of the Northern Fleet, Admiral Vladimir Korolyov. The presence of Russian military personnel in the Arctic carries deep geopolitical significance, and also has an economic and military-political basis. The international legal status of the arctic space, which is rich in hydrocarbons, is yet to be defined. And stemming from that wealth, there is a dispute between the U.S., Canada, Russia, Denmark, Iceland, and Norway, whose shores are all washed by the waters of the Arctic Ocean. In addition, countries not contiguous to it are also claiming these reserves, for example Finland and even China, Japan, South Korea, Brazil, and India. Russia needs to protect its 200 mile economic zone in this region, and this involves the stationing of troops there. The warming of the climate, the melting of ice in the Arctic, and the possibility of sharp reductions on routes from Asian ports to Europe (for instance, instead of having to sail for nearly a month from Yokohama to Amsterdam via the Pacific and Indian Oceans, the Suez Canal, and then the Mediterranean Sea and Atlantic Ocean, a vessel can sail through the Arctic Ocean in two weeks), as well as possibilities for the extraction of oil all create heightened interest in this previously half-forgotten territory. Russian President Vladimir Putin, speaking recently at the Seliger Youth Forum, announced that Russia will revive the military infrastructure and the infrastructure of the Ministry of Emergency Situations in the Arctic, not in order to prepare for a military confrontation in the region, but because, among other things, Russia must ensure the security of convoys of transport ships that travel along the Northern Sea Route. But there is another very serious military-strategic aspect. Today, while relations between the U.S., NATO, and Russia are strained, and when Washington places its military bases and missile defense systems along Russian borders and its ships regularly appear in the Black and Baltic Seas, questions of Russia's security become increasingly urgent. It is not out of the question that, without any deterrents, the same U.S. and NATO ships could soon appear in the Arctic Ocean and threaten domestic strategic missile systems deployed in the Urals and Siberia. Canada, for example, has already started conducting drone flight missions over its polar regions bordering the Russian arctic zone. 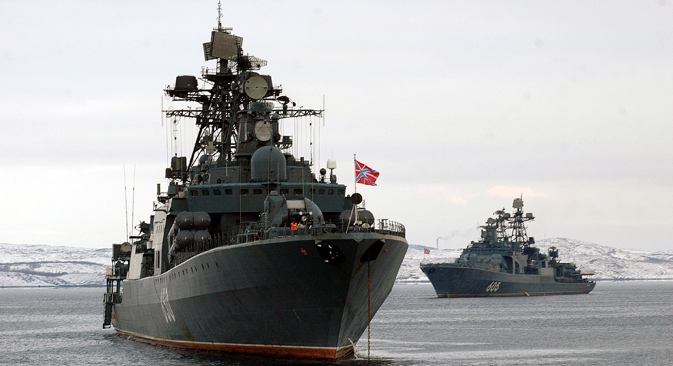 The number of military exercises with foreign powers is also growing here. The arctic states are updating their military power at an increasing tempo, keeping, among other things, the possibility of dealing with Arctic Circle issues in mind. So, to ensure that this does not happen, new domestic military bases are appearing on Wrangel Island, Kotelny Island, the archipelago of Novaya Zemlya, and Franz Josef Land, while the airfields in Tiksi, Vorkuta, Anadyr, and Cape Schmidt that were abandoned in the early 1990s are being renovated and modernized. Russia has declared the Earth's polar cap as a "zone of peace" and invited other states to engage in mutually beneficial cooperation with regard to the development of its resources. But while the country is dressing the Arctic in protective camouflage, it is underscoring its rights to its own piece of this region of the planet.